Apart from tranquillity and relaxation, Sirakoand the surrounding area of Tzoumerka offer the visitors many enjoyable activities during their stay. The Folklore Museum "Erminia Fotiadou" and get to know the way of living of Sirako's inhabitants in the past, as well as the house of poet Kostas Krystallis, that nowadays operates as a folklore museum and a library. The 4 churches of the village, especially the temple, the gold-embroidered epitaph and the stone steeple of Saint Nicholas church, patron saint of Sirako, in the central square of the village (Goura). 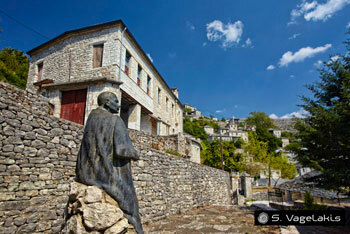 Enjoy a walk in the stone paved streets with the many stone fountains of the village. There is no access for cars inside the village. You should not omit to taste a good tsipouro with fine traditional snacks, pies and spoon sweets in the paved patio of Casa Calda or in the taverns of the village. The nearby with similar natural beauty and architecture Kalarrytes village (2 hours hiking, 12 km by car). 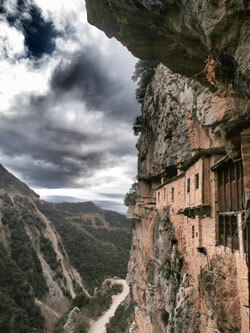 The interesting Monastery of Kipina, which is built inside a large cave of a vertical and inaccessible rock. Pramanta village with the impressive Cave of Anemotripa, about 2 km from the village. Katarraktis village where you can admire the waterfall with its waters falling from a height of 125 metres. Via the Casa Calda guesthouse, you can contact alternative tourism companies that organize rafting, kayak, trekking, archery, horse-riding and many other activities in the area of Tzoumerka. Sirako - Kalarrytes: The beautiful communication path between Sirako and Kalarrytes through the canyon of Chrousia (3 km, 1.5 h). The path of Kiuasa: Route through a forest with chestnuts and cornelian cherries leading to Kalarrytes (4.5 km, 2.5 h). Springs of Chrousia: A beautiful path leading to the large caves from which springs the river Chroussias or Kalarrytikos (5 km, 2 h). Mpozias Waterfalls: A beautiful path right under the village, leading to the spot where two large waterfalls debouch (3km, 1 h). Routes in Mount Lakmos in altitude of 2000 – 2300 metres either by foot or by car in dirt road, getting to know the grassland and climbing the high peaks. 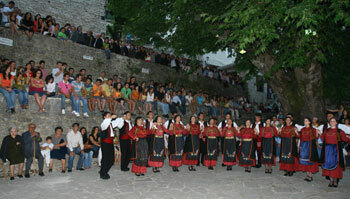 On the 20th of July, celebration of Profitis Ilias. On the 6th of August, celebration of the Transfiguration of the Saviour. On the 15th of August, celebration of the Dormition of Virgin Mary. On the 6th of December, celebration of Saint Nicholas, saint patron of the village.